After revisiting the 1991 movie on Chatflix, my co-hosts and I came to the conclusion that the animated version of Beauty and the Beast is a case of five-star songs trapped in a three-star movie. As beautiful as the film was to look at, it’s never been amongst my favourite Disney animations, and was riddled with unanswered questions. Why exactly did the enchantress curse the prince? Why punish his servants also? If the rose withers when he’s 21, and he’s been cursed for ten years, does that mean he was an 11-year-old prince to begin with? Why does no one in the village know about the castle just on the other side of the forest? And just who has Mrs Potts been having children with? Hilariously, 2017’s Beauty and the Beast fixes most of these plot holes in the first five minutes. This is a confident film that bursts out of the gate strong and barely ever falters. Emma Watson makes a great Belle, and by making the townsfolk actually unlikable, she doesn’t seem so much of a brat at the start. 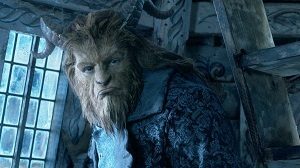 The Beast is wonderfully realised – we’re able to truly see Dan Stevens’ performance through the VFX – but more importantly, I actually understand why they fall in love, what they see in each other. Luke Evans’ Gaston easily rivals his animated counterpart, whilst Josh Gad makes LeFou a much more interesting character. Also, I’m once again impressed at how smoothly Kevin Kline has slipped into supporting roles over the recent years. The production design is as lavish as you’d expect, but through the clever use of particular lenses and colour, it never becomes overwhelming. The cinematography is great except for one particular disappointment: “Be Our Guest”. A flurry of quick cuts and a camera that won’t sit still, this scene was simply too much (not to mention the fact I’m less than enamoured with the new Lumiere design). That being said, “Belle”, “Gaston” and “The Mob Song” are easily as good as the original versions, and Menken’s score is deliciously grandiose but never overwhelming. I love the subtle changes that have been included to fix the more awkward parts of the cartoon, whether it be Belle’s agency or the couple of homophobic punchlines that felt really awkward when I rewatched the film on DVD the other day. It’s clear that Disney threw a tonne of cash at the film, yet the budget never overwhelms the performances. Bill Condon is a fantastic director (with the right material) and you’d be pleased to know that this is closer to Gods and Monsters-Condon rather than Twilight sequels-Condon. With every Disney live-action remake that’s announced, we all cringe, yet so far they’ve done a decent job. The Jungle Book, Cinderella and Maleficent all had their moments, even if I’m yet to meet anyone that’s seen Pete’s Dragon. (I have; it’s mostly forgettable.) Of their upcoming slate, I think Mulan is in the perfect position to blow us all away. For me, this Beauty and the Beast is a definite improvement on the 1991 feature, and barely puts a foot wrong. This entry was posted in Film Reviews and tagged Childrens, Comedy, Fantasy, Musical, Romance by Stuart Wilson. Bookmark the permalink.